BANGKOK: The accumulated death toll from the first five of the so-called seven dangerous days of Songkran has risen to 323, with 3,140 people hospitalised in over 3,000 road accidents across the country, the Road Safety Centre announced earlier today (April 16). Yesterday alone saw 69 people killed and 589 hospitalised in 552 road accidents nationwide, said Damrong Limapirak, adviser to the Education Ministry, citing a report from the Road Safety Centre. This brought the accumulated death toll from April 11-15 to 323. Another 3140 were injured in a total of 3,001 road accidents. Motorcycles were involved in the highest number of crashes (78.53%), said Mr Damrong. People aged over 50 accounted for 23.25% of the road deaths. Traffic accidents occurred mostly between 4pm to 8pm. A total of 178,191 traffic offenders were arrested at 2,031 road checkpoints, including 51,488 motorcyclists without crash helmets and 46,094 people for not carrying a driving licence. Nakhon Ratchasima recorded the highest accumulated death toll from April 11 to 15, with 19 fatalities, while Chiang Mai had the highest number of injuries at 136, and also the highest number of road accidents at 119. 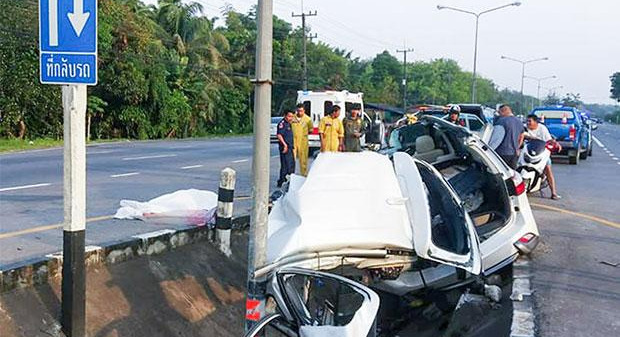 Seven provinces –Yala, Ranong, Satun, Samut Songkram, Nong Khai, Nong Bua Lamphun, and Ang Thong – recorded no deaths from road accidents, said Mr Damrong. One wonders the real death toll, when those that died from injures, sustained from accidents, are added, to the total.